Cherelle Sappleton is a visual artist living and working in London. Her practice centres on photographic media, with an interest in feminist agendas and performance, utilising abstraction and surrealist aesthetics. 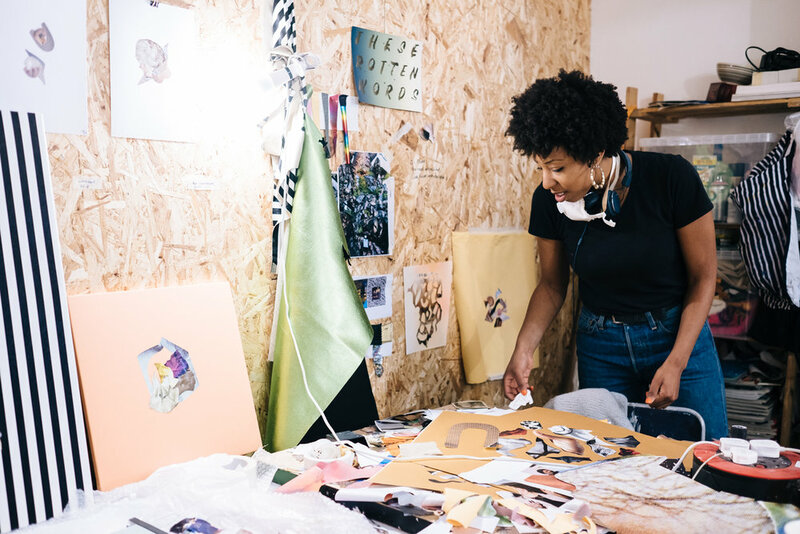 She blends these elements together and draws on her experience as a black British woman to explore issues of representation and agency via collage, moving image and photography. This is the second in a series of posts documenting some of the artists on the Florence Trust residency programme at work in mid-June 2018. At the moment I think 'exuberant chaos' covers it. Mirrors, paint, fake leather and sharp edges. I have to listen to music before I leave the house. It’s something that sets me up for the day and its essential when I’m in the studio making. How did you realise that you wanted to be an artist? What formative experiences shaped your decision? I graduated from a fine art and drama BA in 2006 after which I took a break of 4 years and ended up doing boring administrative/ insurance jobs in the hopes I would get enough experience to do arts administration. I saw this as a practical way to remain in the arts but actually make a living. Anyways, I ended up truly miserable pursuing that path and realised I had to go for it in art in order to be happy—there was nothing else for me, no half measures. In 2009, I applied to do a Fine Art PG Dip in London, moved from Bristol in 2010 and haven’t looked back since. People I admire are artists like Kate Steciw whose practice is something I totally covet—her images and interventions in photographic prints are so satisfying. They are playful, sculptural, direct, sumptuous, hard and soft all at the same time—delicious. John Stezaker, for his incredible theoretical knowledge but also his collages which are so exquisitely executed, they are pure visual magic. Claudia Wieser whose installations are full of texture and colour and feel supremely generous. Are there any quotes that you think of often or live your life by? Or, what is a great piece of advice that helped you in your life or art making? I got introduced to Nichrein Buddhism via my sister a little while ago and although I don’t ‘practice’, the teaching that stuck with me is the idea that you ‘turn poison into medicine’ the message being that all of the challenges, problems or tragedies in one’s life are an opportunity to learn and improve yourself. It’s not easy but if you live by that you can basically conquer anything and everything as problems are not problems anymore or something outside of your control, they are an opportunity, a route to self improvement and prosperity. What is the book (or books) that you have gifted the most and why? Or what are the 1-3 books that have greatly influenced your life? I don’t really have a habit of gifting books…I do recommend Who Moved My Cheese a lot though. It’s a short psychological/philosophical book that teaches a very basic and profound lesson about being adaptable which is suitable for children and adults alike. I recently recommended Street Hauntings by Virginia Wolf—a very short story that takes the reader on a walk around the St Johns Wood area—beautifully written. I’m supposed to be learning Spanish but my Babbel pro subscription has run out…The residency has taken all my brain space- must do better. My practice expands and contracts depending on my access to space and materials—such is the working class artist’s life. Whilst I’ve been doing the Florence Trust Residency, I’ve been able to introduce a multitude of materials and work on a larger scale than previously. From working predominately in monochrome, over the part couple of years I've been introducing more colour into my work which definitely reflects my headspace. The materials; faux leather, paint, printed vinyls, mirror as well as photographic prints are very much to do with wanting the viewer to think about images as tactile/ sculptural objects and elicit a visceral response. Often, the sighted take for granted that visual processes are passive but seeing involves the whole body not just the eyes. I think an artist’s life is full of failure generally and that's not a bad thing with respect to artistic practice. One should always be trying new things out and experimenting. Some things might not work out, but can lead to exciting routes or methods. Of course, responding to open calls, prizes and not being selected is a regular occurrence for a lot of early career artists. You just get have to get over it and accept that as well as seeking opportunities, you have to create them for yourself. Listen to music, read, see shows, party hard. What advice—big or small—would you give to an artist or creative, just beginning on their journey? What advice should they ignore? Seek alliances with other artists—it’s not useful to view others as competition, what you have to offer is different and success means different things to different people. Don’t compare yourself to other artists, especially those who appear to be ‘doing well’. Who knows where your career will take you—focus on getting better at what you do, not chasing what others have. What advice do you think your future self—ten years older and wiser—would give you, looking back at where you are now? It’ll probably be to do with networking and not being so shy… muh.